Switchplate covers can be subtle ways to bring medieval or fantasy style to your home, or they can provide an extra touch of detail to themed spaces. We offer switchplate covers and lightswitch covers made in medieval, gothic, Celtic, and fantasy styles that will take the design of any room to the next level. Especially unique yet easy to install, these home decor pieces will fit right into the walls of your home. Lightswitches might be modern conveniences, but that does not mean they cannot be given a touch of medieval or fantasy style. Shop here for our ever-growing selection of themed switchplate covers, as more pieces will be added as they become available. This Laughing Leafman Switchplate is the perfect way to bring a touch of jovial mischief and natural design into your home! 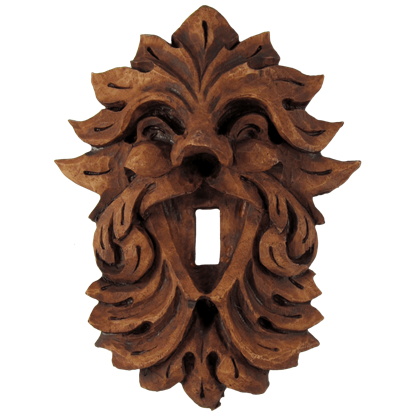 When installed, this accent makes the greenman a part of your decor, one that is woven into your very walls!